For the second year running, A1 Flue Systems has been named Contractor of the Year at the prestigious Heating and Ventilation Review (HVR) Awards. It’s the third time in five years we have won this award at the event, which is a gathering of the leaders of the heating and ventilation industry. Our Director TJ was on hand to pick up the award at the event, which was held at London’s Chelsea Harbour Hotel, and said it’s another huge accolade for a family business that has grown to become the UK centre of excellence in flue design and manufacture. 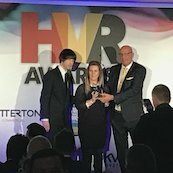 “The HVR Awards are one of the highpoints of our industry’s year, and to win Contractor of the Year once is a big deal – but to win it for a second year in a row is absolutely incredible,” said TJ. The judges were impressed with our continued growth over the last 12 months and how we have overcome the challenges and financial losses caused by the collapse of Carillion. We were also able to demonstrate how we’ve continued raising the bar in key areas such as manufacturing standards, training, innovation and championing women in manufacturing. The fact that we remain the only UK company that has achieved the CE Mark for a full flue system and the only UK flue company that is Gas Safe registered highlights the standards we set for ourselves, which are above and beyond others in our industry. The award is also recognition of our work in promoting women in manufacturing and construction, after TJ was recently named in the top 20 leading figures in the UK manufacturing industry. And, earlier this year, a panel of women at A1 were interviewed by ITV News at Ten for a feature on women in manufacturing and construction. The awards also reviewed the projects that we have completed. As well as working on high-profile projects, we work on a raft of ‘bread and butter’ contracts for schools, hospitals, hotels and office blocks. This year, for example, we completed work on manufacturing and fitting bespoke flue systems for two condensing gas boilers and a further two heat and power cogeneration units at a new low-carbon energy centre adjacent to the existing cluster of R&D facilities on Coventry University’s technology park.